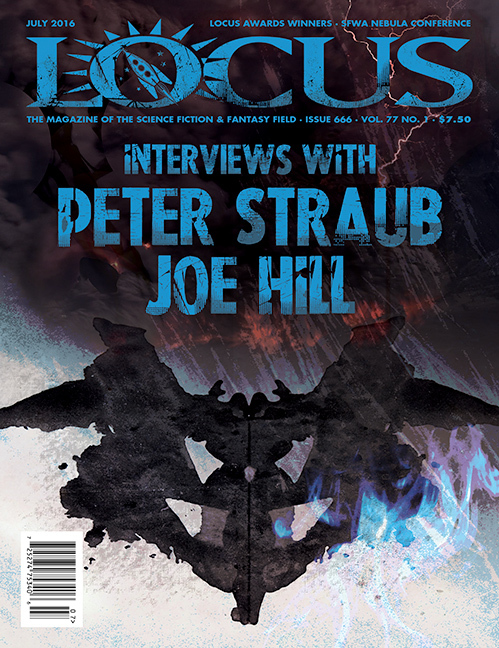 The July 2016 issue of Locus is numbered #666… so naturally it’s the horror issue, with lengthy interviews with Peter Straub and Joe Hill, and a photo story on “Stephen King and George R.R. Martin in Conversation.” The magazine is also packed with the usual reviews, news and features — including a photo spread on the Nebula Awards weekend, held here in Chicago. But the big news for me was the detailed results of the annual Locus Awards. Amongst all the vote counts for Best Novel, Best Collection, and Best Editor, were the surprising results for Best Magazine. Surprising to me, anyway. 27 magazines were ranked by the readers of Locus; here’s the Top Ten. I was surprised and pleased to see Black Gate ranked above such excellent magazines as Beneath Ceaseless Skies, Interzone, Nightmare, Shimmer, and Weird Tales. I want to thank everyone for their support — believe me, it means a lot. You can read our coverage of the winners of the 2016 Locus Awards here. Besides the detailed Awards results — and if you’re looking for reading recs on the best SF and fantasy of the year, this is is definitely the place to get them — the July Locus is packed with lots of other great stuff, including news on the 2016 Chesley Awards and 2016 British Fantasy Award Nominees, features on the 2016 Launch Pad Workshop and the Delany Hall of Fame Induction, a column by Cory Doctorow, and reviews of short fiction and new books by Jonathan Strahan, Neil Gaiman, Patricia A. McKillip, Ann & Jeff Vandermeer, Joe Hill, Stephen King, and many others. In addition to all the news, features, and regular columns, there’s also the indispensable listings of Magazines Received, Books Received, British Books Received, and Bestsellers. Plus Letters, and an editorial. See the complete contents here. 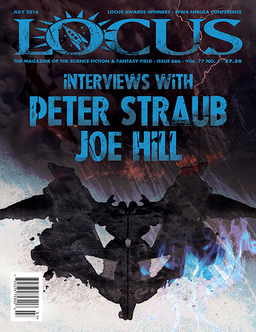 We last covered Locus with the April 2015 issue. Locus is edited by Liza Groen Trombi, and published monthly by Locus Publications. The issue is 66 pages, priced at $7.50. Subscriptions are $63 for 12 issues in the US. Subscribe online here. The magazine’s website, run as a separate publication by Mark R. Kelly, is a superb online resource. It is here. See our July Fantasy Magazine Rack here, and all of our recent Magazine coverage here. I just wish there was still a print edition of BG, but those times are like dust in the wind. John, Congratulations. Well deserved. As you know, Black Gate is our favorite of all the monthlies, not only because it rises above political considerations and stays far from the sway of self-proclaimed experts, but also because BG is inclusive of so many books that don’t fit narrow genre restrictions. We hope you’ll continue to bring our attention to many stories and writers, old and new, we may otherwise miss. Life to you, John et al, and everlasting glory. > I just wish there was still a print edition of BG, but those times are like dust in the wind. Me too, Scott… but the death of the print version has allowed me to focus on several other exciting projects, including the BG website. And that’s reached a much larger audience than the magazine every did. Many thanks, Janet and Chris! Black Gate is my #1!